For the post-Roman and medieval petty kingdom, see Kingdom of Dyfed. Dyfed (Welsh pronunciation: [ˈdəvɛd]) is a preserved county of Wales. It was created on 1 April 1974, as an amalgamation of the three pre-existing counties of Cardiganshire, Carmarthenshire and Pembrokeshire. It was abolished twenty-two years later, on 1 April 1996, when the three original counties were reinstated, Cardiganshire being renamed Ceredigion the following day. The name "Dyfed" is retained for certain ceremonial and other purposes. It is a mostly rural county in southwestern Wales with a coastline on the Irish Sea and the Bristol Channel. Dyfed is a preserved county of Wales. It was originally created as an administrative county council on 1 April 1974 under the terms of the Local Government Act 1972, and covered approximately the same geographic extent as the ancient Principality of Deheubarth, although excluding the Gower Peninsula and the area west of the River Tawe. The choice of the name Dyfed was based on the historic name given to the region once settled by the Irish Déisi and today known as Pembrokeshire (the historic Dyfed never included Ceredigion and only briefly included Carmarthenshire). 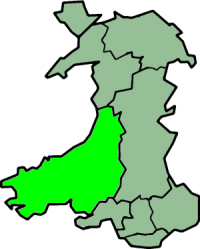 Modern Dyfed was formed from the administrative counties (which corresponded to the ancient counties) of Cardiganshire, Carmarthenshire, Pembrokeshire and was divided into the following local government districts. The county town and administrative headquarters of Dyfed was Carmarthen whilst the largest settlement was Llanelli. Other significant centres of population included Haverfordwest, Milford Haven and Aberystwyth. The first election to Dyfed County Council was held in April 1973, and the vast majority of the councillors elected had been members of one of the three previous county authorities which were merged to create Dyfed, namely Cardiganshire, Carmarthenshire, and Pembrokeshire. The Independents gained a majority and retained this at subsequent elections. At the 1977 election, Plaid Cymru gained some ground although not to the extent that was seen in parts of the South Wales valleys in that year. 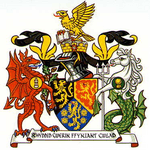 On 1 April 1996, under the Local Government (Wales) Act 1994, Dyfed County Council was broken up and the resultant councils were based on the ancient counties, now restored for administrative purposes: Cardiganshire, the council of which renamed itself Ceredigion the following day; Carmarthenshire; and Pembrokeshire. The name Dyfed was retained for such purely ceremonial purposes as the Lord Lieutenancy and in the name of some regional bodies such as Dyfed–Powys Police. Dyfed has a long coast on the Irish Sea to the west and the Bristol Channel to the south. It is bounded by the preserved counties of Gwynedd to the north, Powys to the east and West Glamorgan to the southeast. Cardiganshire, the northernmost part of Dyfed, has a narrow coastal strip and the Cambrian Mountains cover much of the east of the county. The highest point is Plynlimon at 2,467 feet (752 m), on the slopes of which five rivers have their sources: the Severn, the Wye, the Dulas, the Llyfnant and the Rheidol, the last three of which flow westwards to the Irish Sea. Further south in Cardiganshire the land is less mountainous, and the River Teifi forms the border with Carmarthenshire for part of its length. Carmarthenshire, the southeastern part of Dyfed, is mostly hilly, except for the river valleys and coastal strip. Fforest Fawr and Black Mountain extend into the east of Carmarthenshire and the Cambrian Mountains into the north. The highest point in Carmarthenshire is Fan Brycheiniog, 2,631 feet (802 m), on the border with Powys. The River Towy is the largest river and drains into the Bristol Channel, as do the River Loughor, the River Gwendraeth and the River Taf. Carmarthenshire has a long coastline which is deeply cut by the estuaries of the Loughor, Gwendraeth, Tywi and Taf. The south coast has many fishing villages and sandy beaches and the eastern part around Llanelli and Burry Port is more industrial. Pembrokeshire, the southwestern part of Dyfed, juts out into the Irish Sea and has a long, much indented, coastline. It does not have the mountains found in other parts of Dyfed but much of the interior is still hilly. In the north are the Preseli Hills (Mynydd Preseli), a wide stretch of high moorland. The highest point in the Preseli Hills is Foel Cwmcerwyn at 1,759 feet (536 m), and this is the highest point in Pembrokeshire. The largest river is the River Cleddau which has two main branches which join to form the Daugleddau estuary, which forms the important harbour of Milford Haven which enters the sea at the southwestern corner of the county. The areas around the River Cleddau are mainly level, low-lying land with many inlets and creeks. The coastline of Pembrokeshire has cliffs in places, and numerous bays and sandy beaches. The county contains the Pembrokeshire Coast National Park, which contains the 186-mile walking trail, the Pembrokeshire Coast Path. Dyfed Facts for Kids. Kiddle Encyclopedia.